Hi, I'm not quite certain how to interpret the data below and would like to seek your opinion on it. I have meta-genomic and meta-transcriptomics of a sample, and calculated the relative abundance/activity of each taxa. The rel. activity/abundance are calculated as proportion of reads mapped to each taxa. When I plotted RNA vs DNA, the spearman correlations are pretty low ~0.3. However, when I plotted the RNA/DNA ratio vs DNA rel. abundance, there is negative correlation between the 2. 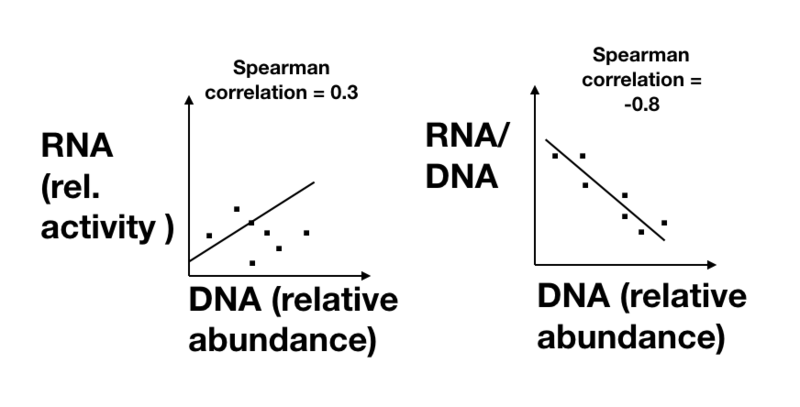 Is it correct then to interpret that more abundant taxa tend to have lower RNA/DNA ratio, hence less active? Or am I simply plotting1/DNA vs DNA, which obviously will give me a negative correlation?